This story is the third part in a four-part series about our Halfsy Hero, Michelle Paxton. Our series will follow Michelle and three other heroes as they train for the November 6th Good Life Halfsy. As the Halfsy gets closer, Michelle said she feels more mentally prepared than physically prepared. She’s run lots of races, so the race day jitters aren’t her concern. Instead, she’s more worried about how her body will hold up. It’s been a frustrating fall of training, Michelle said. She’s had injuries, soreness and hasn’t been able to push herself the way she normally does. It’s been hard because Michelle is competitive. She runs fast and pushes herself to her limit, and not being able to do that has been a challenge. Michelle said she’s working to stay positive during these last few weeks of training, taking one day at a time and being thankful that she has the ability to run. Michelle also said she knows she’ll have a lot of support on race day, both from her family and her racing team. 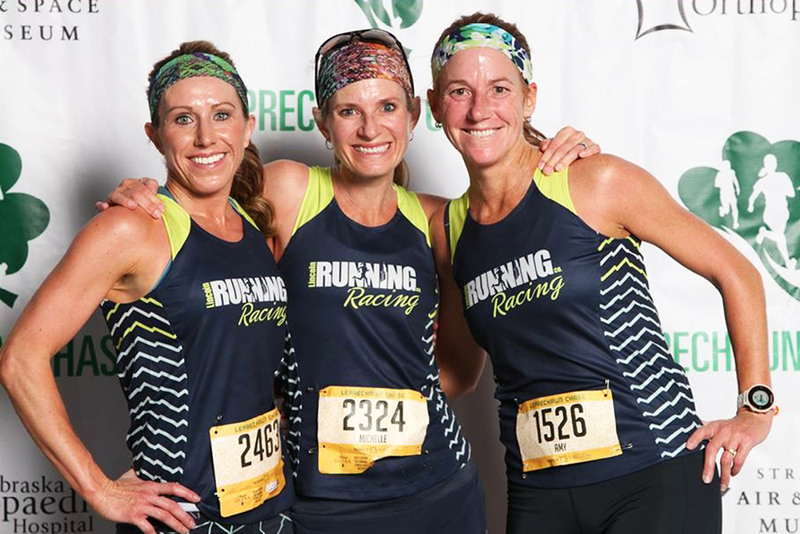 Michelle is part of the women’s Lincoln Running Company racing team and loves how she gets to compete and train with a group of ladies who enjoy the sport so much. On race day, Michelle and her fellow teammates will run their individual races, but they’ll all be wearing the same shirts, helping them identify and encourage each other along the route. It’s another way to build the running community in Lincoln, Michelle said, and she’s very thankful to be part of this group. In the coming weeks, Michelle will start to taper off her running, giving her body time to rest and regroup before the race. She’ll put an extra focus on eating well and making sure she gets enough rest so that she feels ready to go on race day. Despite the number of races she’s run in her life, Michelle said, like most runners, she still gets a little nervous during the days leading up to the race. She tries to stay positive and has found that being prepared helps calm her nerves. She makes sure she has the right gear for any kind of weather, packs a few GU energy gels and takes note of the drink stations on the course. More than anything, Michelle said she’s just excited for the race to be here. She’s ready to run the race her body is equipped to run. It might not be a PR, but she’s set on pushing herself to her max and seeing what her body can do. Check back for more Halfsy Hero stories and to read the final installment of Michelle’s story.